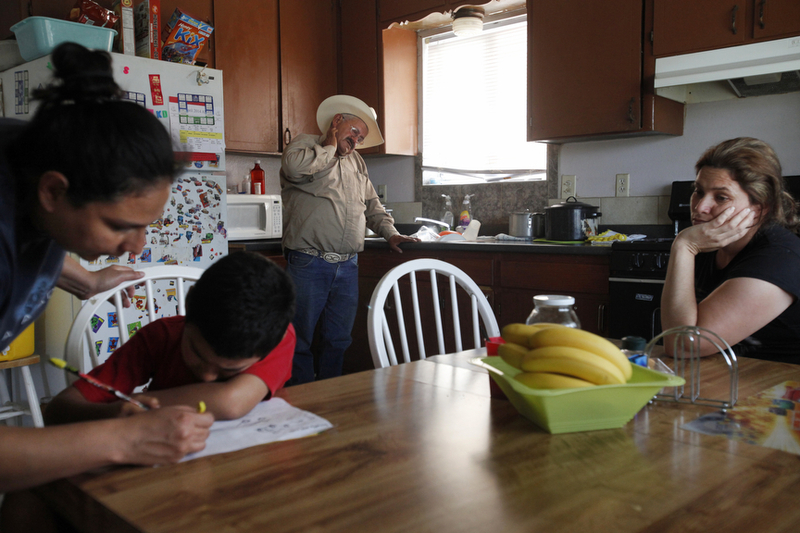 Both unemployed, Jose Pineda Rivas, 61, center, stands in the kitchen with his wife, Maria Callejas, 43, right, as Ruth Fuentes, 32, left, helps her son Jose, 6, with his homework at Fuentes' home April 10, 2014 in Mendota, Calif. Rivas and his wife have been living with the Fuentes' family for four years. Rivas came to the United States in 1988 and was joined by his wife 3 years ago. They left five children behind in El Salvador, who they send money to every month. Both Rivas and his wife work in the fields for their income. Right now neither of them have been able to find steady work and the stress is taking its toll. Rivas has been having trouble sleeping and eating due to a constantly upset stomach and a toothache he cannot afford to repair.